Hap­py Fourth of July 2009. 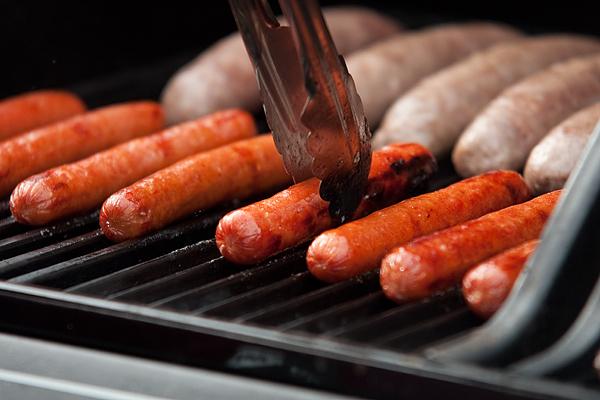 Let’s cel­e­brate by get­ting out the grill and cook­ing up some dogs! Maybe some brats, sausages and burg­ers too. A grill­mas­ter ad­justs his hot­dogs so that they all line up and cook even­ly. P.S. : For all you ve­g­atar­i­ans and ve­g­ans out there, take a nice bite in your non-meat equiv­e­lent of a hot­dog. Here are four im­ages from my edit of my “top” five im­ages for the June 23 Saints game. En­joy. You have seen two of them so far and will get an­oth­er one to­mor­row for the Fourth of July. A young girl plays with an Elmo toy be­fore a St. Paul Saints game on June 23, 2009. The Souix Falls Ca­naries right field­er slides to make a catch dur­ing a game against the Saint Paul Saints on June 23, 2009. The Saints won the game 12–3. But wait, there’s more, here are two more im­ages you have al­ready seen, but larg­er and ready for the web. St. Paul Saints out­field­er Ja­cob But­ler cel­e­brates with first-base coach Char­lie Ruud af­ter But­ler hit his sec­ond of two home runs of the in­ning as part of an 11-run bot­tom-of-the-sixth for the Saints. The Saints beat the Sioux Falls Ca­naries 12–3, in part due to But­lers 5 RBI, on June 23 at Mid­way Sta­di­um in Saint Paul. In cel­e­bra­tion of Minnesota?s his­to­ry in the Ne­gro Leagues, both teams donned uni­forms of past Ne­gro League teams. The Saints wore the uni­form of the Home­stead (Penn.) Grays while the Ca­naries donned the uni­form of the Newark (N.J.) Ea­gles. St. Paul Saints pitch­er Mitch Wylie throws a fast­ball dur­ing a game againts the Souix Falls Ca­naries on June 23, 2009. Wylie pitched six in­nings, giv­ing up just three runs, all in the first two in­nings, while strik­ing out six bat­ters. Wylie im­proved his record to 5–2 with the win. 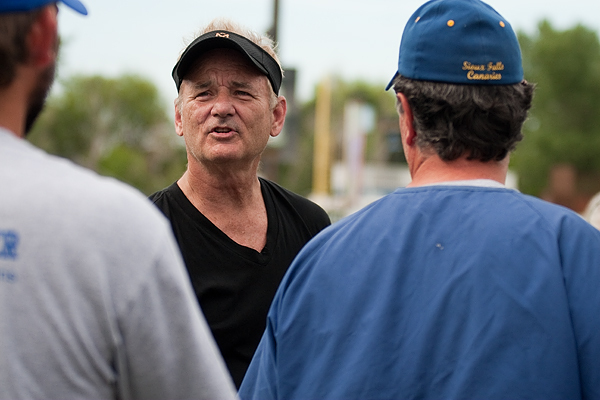 Ac­tor and com­pe­di­an Bill Mur­ray, a part-own­er of the St. Paul Saints, at­tend­ed the game while we were there. 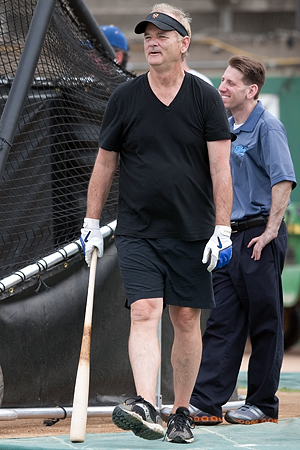 I got a few shots in­clud­ing one dur­ing bat­ting prac­tice. Ap­par­ent­ly he and now Sen.-elect Al Franken were there the next day. More to come from the Saints game. Also I’m go­ing up North to­day for a few days over the Fourth of July, so I’ll try to work on some stuff up there to get ready to go on­line. Here is my first im­age from the Saints game. 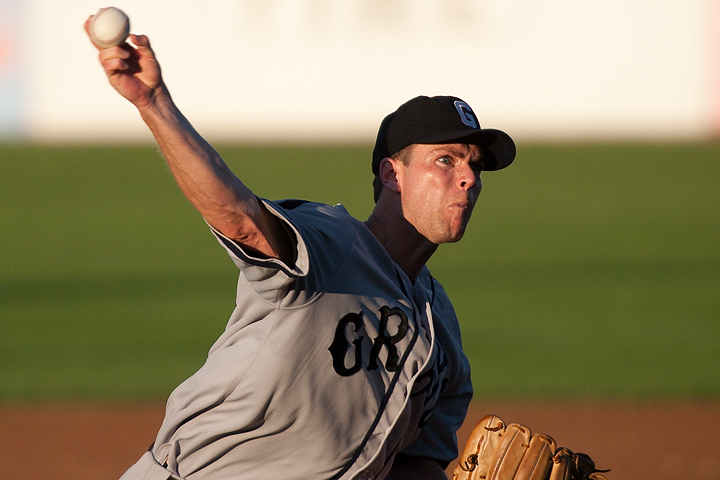 St. Paul Saints pitch­er Mitch Wylie dur­ing a game against the Sioux Falls Ca­naries on June 23, 2009. 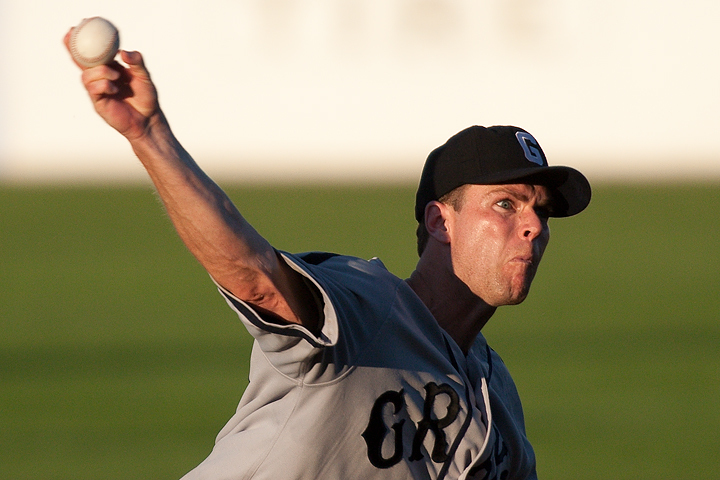 St. Paul Saints pitch­er Mitch Wylie dur­ing a game against the Sioux Falls Ca­naries on June 23, 2009. Wylie pitched six in­nings, giv­ing up just three runs, all in the first two in­nings, while strik­ing out six bat­ters. Wylie im­proved his record to 5–2 with the win. 1/3200 sec; f/4; ISO 400; 420 mm; 8:14 p.m.
More to come, in­clud­ing co­me­di­an and ac­tor Bill Mur­ray. Thanks for look­ing; comments/questions/concerns wel­come. 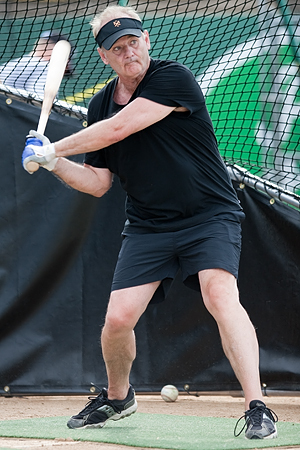 St. Paul Saints out­field­er Ja­cob But­ler cel­e­brates with first-base coach Char­lie Ruud af­ter But­ler hit his sec­ond of two home runs of the in­ning as part of an 11-run bot­tom-of-the-sixth for the Saints. The Saints beat the Sioux Falls Ca­naries 12–3, in part due to But­lers 5 RBI, on June 23 at Mid­way Sta­di­um in Saint Paul. In cel­e­bra­tion of Minnesota’s his­to­ry in the Ne­gro Leagues, both teams donned uni­forms of past Ne­gro League teams. The Saints wore the uni­form of the Home­stead (Penn.) Grays while the Ca­naries donned the uni­form of the Newark (N.J.) Ea­gles. More im­ages to come at a lat­er date.